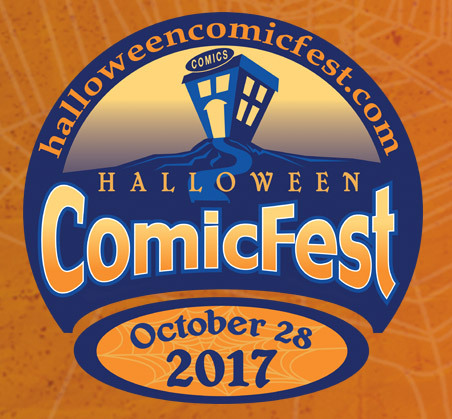 Halloween ComicFest 2017 Full List of Comic Books Announced! Halloween ComicFest (HCF) is proud to announce the full list of comic book titles for the comic book industry's most anticipated fall annual event! HCF takes place every year on the Saturday on or before Halloween at participating comic shops worldwide, with this year's event taking place on Saturday, October 28. This year, HCF features a whole new selection of 30 comics--18 Full Size and 12 Mini-Comics--and features comics for everyone: from tiny goblins and ghouls, to witches and warlocks, to crypt-keepers and zombies alike. The Full Size comics have a wide range of stories from all ages, to teen, and mature ratings; whereas, the all-ages mini-comics are perfect for the trick-or-treaters in your life! The mini-comics are available to purchase in packs before Halloween ComicFest and are encouraged to be given out in classrooms and to trick-or-treaters on Halloween night. "We're so excited for Halloween ComicFest this year," said Halloween ComicFest spokesperson Michael Moccio. "Halloween ComicFest continues to grow year after year and with this year's selection of titles, we're confident 2017 will be no exception. There's definitely something for everyone, and we're excited for all the trick-or-treaters this year to get a whole new batch of mini-comics featuring a great variety of titles!" A complete listing of all 30 HCF titles, including the 18 Full Size and 12 Mini-Comics, can be found in the July issue of Diamond Comic Distributors' PREVIEWS catalog, on sale at all comic shops June 28, 2017. Fans are encourage to pre-order the mini-comic polypacks in July to ensure they're available at their local comic shop come October! For more HCF news and updates, visit www.halloweencomicfest.com and become a fan on Facebook at https://www.facebook.com/halloweencomicfests/ and follow on Twitter at https://twitter.com/halloweencomic.